They say the most beautiful and deepest experience a man can have is the sense of the mysterious. For me it is the wonders of the cosmic realm. The mysteries of the moon, stars and our Milky way galaxy. On a fine summer evening, I walked the trails along the southern rim of Grand Canyon National Park. Sun stood still for several hours and went down below the horizon casting orange hues. I stood there for hours embracing the glory of Grand canyon, something so unparalleled wonders of the natural world. Then come the darkness, and the lights from the million stars adorned the rocks of the carved earth. Although faint, I could see the grandeur of the majestical depth of Grand canyon. I was awestruck! 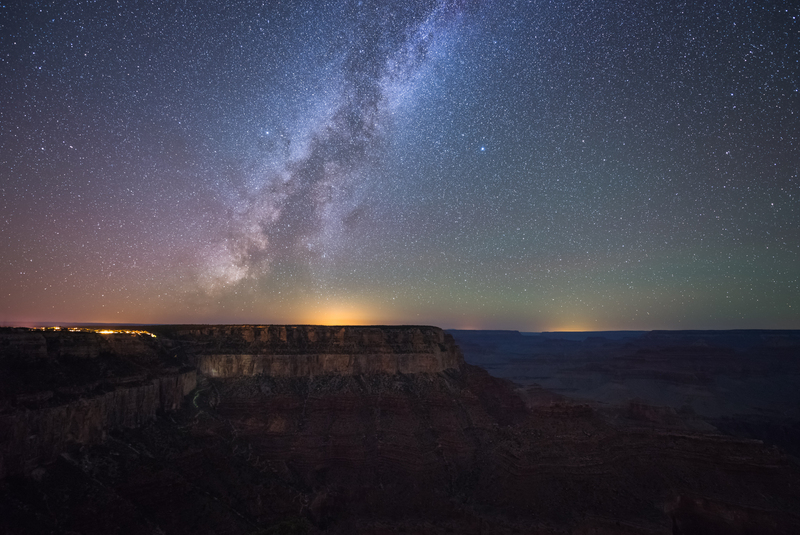 The spiral arm of the milky way spun across the rim of the grand canyon, a strange juxtaposition. It was as if the galactic core of the milky way aligned perfectly with the canyon land shimmering upon it’s depth with silver star light. Such is the mysteries that remains at the heart of our universe.